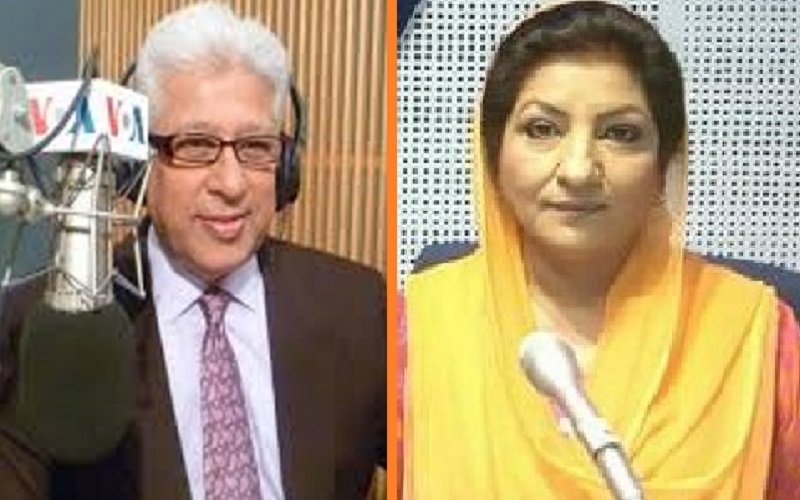 Khalid Hameed and Ishrat Fatima are probably the most famous newscasters of Pakistan Television along with a few more names from the past. 1980's and 90's were the peak times of their career and fame and they were among top celebrities of the country. Ishrat Fatima, known as Ishrat Saqib after her marriage, was especially popular in females and even the name 'Ishrat Fatima' became popular trend in Pakistan in 90's. People of 80's and 90's can easily recall the memories of her fame back in gone times. Khalid Hameed left everyone behind in popularity and was considered highly respected and famous newscaster of the past. People used to wait to see him daily at 9pm on PTV Khabarnama. Why they left PTV is a question many Pakistanis think and we hope an answer is coming soon. But it was late 90's when everything started changing at PTV and old faces started leaving, or were forced somehow to leave Pakistan Television. New and unknown faces popped up so fast and then the rapid intervention of internet and cable television didn't let anybody search and know where those old faces gone. Common Pakistanis remained unaware about the how know of many old PTV stars for many years and then after many years things started opening due to social media and suddenly the lost faces started appearing back and we saw them in photos and videos. We were told that Khalid Hameed is in United States but how is he and what is he doing there came to knowledge few years back when he was discovered on Facebook and it was great surprise to see him reading news. Same face with same voice of Khalid Hameed, but he was not reading news for PTV. Khalid Hameed joined famous American news network in United States, Voice of America (VOA), after leaving PTV and Pakistan. It was basically a radio service but as media trends changed, VOA brought its activities on social media. Khalid Hameed's news bulletin is streamed live on Facebook and many of his fans and followers see him regularly reading news. On other hands, after years of anonymity, Ishrat Fatima was also discovered on Facebook and then she was seen reading news on Facebook page of Radio Pakistan. There was no change in voice and style of reading news but surely it was not for the screen of Pakistan Television. The social media brought both of the stars of PTV news to their fans and the most important thing is to see them reading news. There is also a third name from old newscasters who is still active in news field but he is basically now in management. Its Masroor Kazmi who is not only associated with news but he is still associated with Pakistan Television and working in news and current affairs section. He sometimes appears for news reading if needed in late night hours. Like many others, you might also be thinking that if Khalid Hameed and Ishrat Fatima can still read news for Voice of America and Radio Pakistan, why can't they read news on PTV? Basically it's a million dollar question but there is no one to answer. How many names of current PTV newscasters you know who are appearing now a days? Well, we can only get Zubair Siddiqui and nobody else. But we all still remember Khalid Hameed, Ishrat Fatima, Azhar Lodhi, Hameed Akhtar, Zubair Ud Din, Shabana Habib, Shaista Zaid and many others from the past. Who can tell the PTV administration to think and review their strategies and give some value and space to the opinions and feeling of people of Pakistan and bring these assets back to PTV before its too late. Well, we can only think, speak and shout. But at this moment of July 2018, we can see our two star old newscasters, Khalid Hameed and Ishrat Fatima, still reading news and we can watch and listen them.